The Assyrians were fierce warriors whose kingdom was upstream on the Tigris River from the Babylonians. Their armies conquered Babylon in 911BCE and over the next three centuries, the Assyrians built the largest and powerful empire the world had known at that time. By the seventh century BCE, Assyrian armies seized lands stretching from Egypt in the west, across Mesopotamia to Persia in the east. The Assyrians ruled over their empire with great cruelty, forcing cities to pay tribute. Tribute is payment for protection. The tribute from throughout the region made Assyrian warriors rich. The wealth also allowed the Assyrians to invest in military technology that made their armies even more fearsome. Iron swords, lances, and armor strengthened the Assyrian army because iron weapons were stronger than the bronze weapons used by other civilizations of that era. 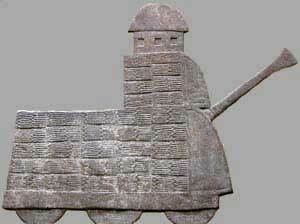 The Assyrians also used iron to create powerful battering rams. In its most simple form, a battering ram is a large, heavy log carried by several men and propelled with enough force to break down city walls. The Assyrians added wheels and canopies to their battering rams. A canopy is a small roof that protected Assyrian soldiers from rocks and spears thrown down at them by defensive forces standing atop city walls. The invention of spoke wheels made Assyrian chariots lighter, faster, and better prepared to outrun soldiers and other chariots. This allowed Assyrian archers to shoot arrows from the chariot and escape before opponents had the opportunity to counter-attack. Arrows from their deadly crossbows could penetrate the armor of rival soldiers. About 1000BCE, the Assyrians introduced the first cavalry. A cavalry is an army that fights on horseback. The saddle had not yet been invented, so the Assyrian cavalry fought on the bare backs of their horses. The Assyrian cavalry was also better outfitted for war, with chain mail and leather boots. 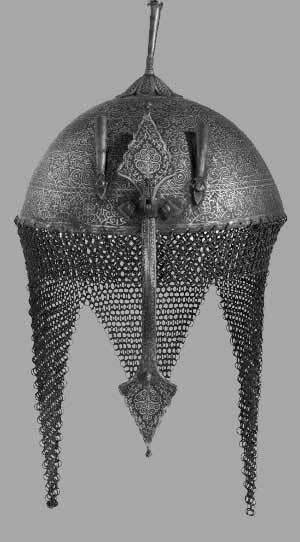 Chainmail is a type of armor consisting of small metal rings linked together in a pattern to form a mesh. While other armies fought in sandals, leather boots protected Assyrian soldiers while they were around horses, and prepared the Assyrian army to fight in rough terrain and in cold weather, rain, and snow. 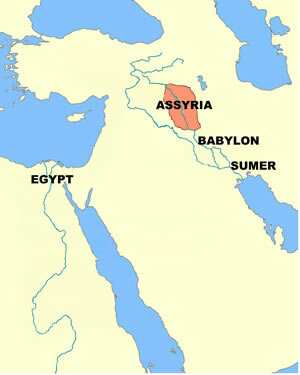 Soon after the death of the warrior king Assurbanipal in 627BCE, widespread revolts toppled the Assyrian Empire. Babylon recaptured Mesopotamia under the rule of their warrior king, Nebuchadnezzar. Mesopotamia later fell to many invading armies that included the Persians, the army of Alexander the Great, the Romans, the Turks and the British. Mesopotamia is now part of the modern nation of Iraq, a country that is struggling to develop democratic government after the brutal dictatorship of Saddam Hussein ended in 2003. The Assyrians were a fierce warrior kingdom who lived upstream on the Tigris River from the Babylonians. Ashurbanipal (668 – c. 627BCE) was the last strong king of the Assyrian Empire. 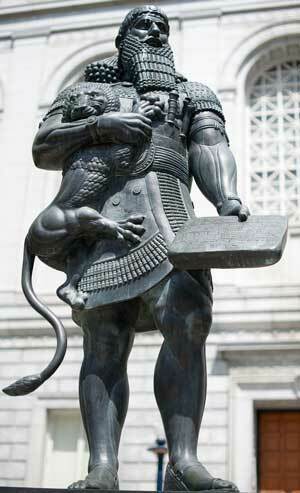 This bronze sculpture of the Assyrian king has stood in front of the Civic Center of San Francisco, California since 1988. Chain mail is a type of armour consisting of small metal rings linked together in a pattern to form a mesh. The Assyrians used A battering ram to break down the walls of enemy cities or to splinter their wooden gates.